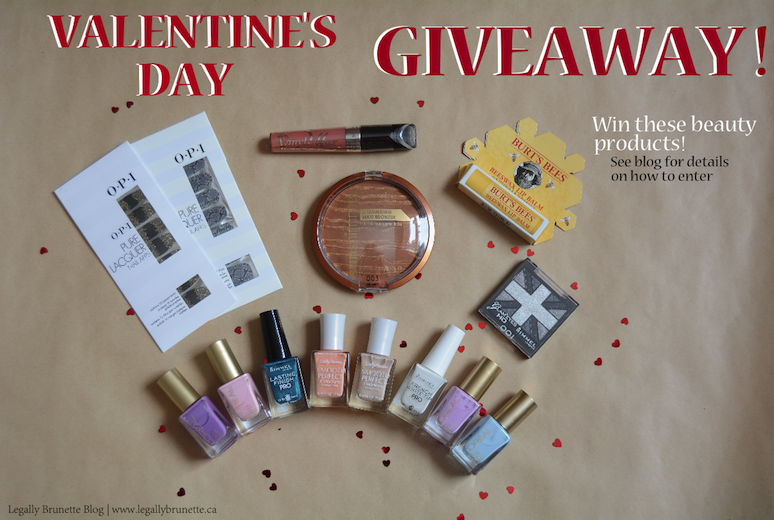 In honour of the success of my blog thus far, I have decided to do a Valentine's Day GIVEAWAY as a way of thanking my lovely readers! As Valentine's Day is exactly one month away, the giveaway will run for two weeks and close on February 1st at 11:59 p.m, so you can receive the prizes before Valentines Day! **For a bonus entry to increase your chances of winning, 'Like' the official Legally Brunette Facebook page. (1) Burt's Bee's Lip Balm - Beeswax lip balm, a winter essential to keep that pout moisturized! (4) O.P.I Pure Lacquer Apps - Winner's will get both nail app packets, snakeskin & black and lace. I'd go for the black and gold lace this Valentine's Day but the snakeskin should defiantly make an appearance this Spring. (5) Rimmel Sun Shimmer Bronzer in the shade 'Sun Queen' - get the perfect sunkissed glow and illuminate your face! Just because it's Winter doesn't mean you have to be pale and pasty! (6) Nail Polish - Each winner will get the 8 nail polish bottles below. I've chosen colours that are IN this Spring as well as pink tones to rock this February 14th. My favorite out of all was the nail polish which it will suit anyone who wants to wear which they are SUPER CUTE!!!!!! (>\\\<) <3 :3﻿ Also it will fit really well for any event!!! Thanks for stopping by my blog! Great giveaway, hard to pick a favourite product! But if I'd really have to choose I would say the nailpolishes, really great colours. I follow via GFC under the name of Madison C. :) Thank you so much for the great giveaway! The nail polish is my total favorite! I am most interested in the Rimmel Lip gloss! Looks perfect for a valentine's day rendezvous!! Thank you! I follow you on google friend connect! I am most interested in the nail polishes, all of them really! I absolutely love nail polish and the colors you've chosen are really pretty. They would be a great addition to my collection! Very pretty outfit. I miss ice skating. I haven't done it in so long I don't even think I can stand in the rink without falling flat on my face. Thanks so much for the lovely giveaway hun! I’m really excited for the Rimmel Glam'Eyes HD Eyeshadow Palette! the Burt's Bee's Lip Balm! I’ve heard amazing things about it. Love this giveaway! Especially the nail polishes! Thank you for this awesome giveaway!! Those products are incredible and it’s difficult for me to choose a favourite product, because all are fabulous…nevertheless, I would really love to choose the nail polishes and the bronzer! the Rimmel Sun Shimmer Bronzer are my favorite. I follow on GFC maria. I love the nailpolish!! Awesome spring colors!! But everything is fab that you picked! My favorite is L'Oréal lilac coolers Nail polish! This giveaway is amazing :) Thank you! My favorite is the eyeshadows! gray looks awesome on me. Thanks for the awesome giveaway! What a great giveaway! My favorite is Rimmel Sun Shimmer Bronzer. Thanks for awesome giveaway! I LOVE the opi nail apps! !